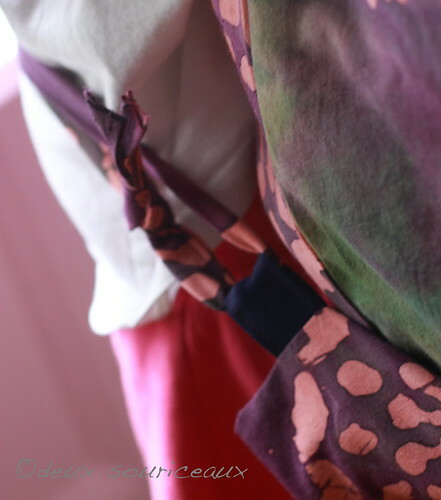 Home › Creating › Sewing › I Learned From My Mistakes! I Learned From My Mistakes! The mistakes being in the making of that blanket. What mistakes? For starters, I had never quilted before but I didn’t take the time to read up on quilting. And I cut corners, trying to cut too much fabric at the same time. And I didn’t really plan anything. So basically, one huge mistake of not taking my time? 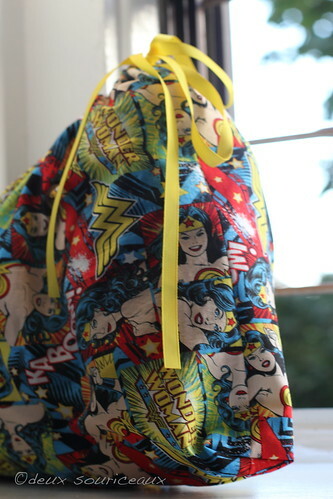 So when I needed to make a bag for V’s extra set of clothes (for preschool), I knew I could figure it out. Drawstring bag. Easy-peasy. But how big do I need to make it? My brain was fried so I grabbed a book. Weekend Sewing. I can’t say I’m crazy about this book but it has a pattern for drawstring bags in three sizes. I decided on a medium one. 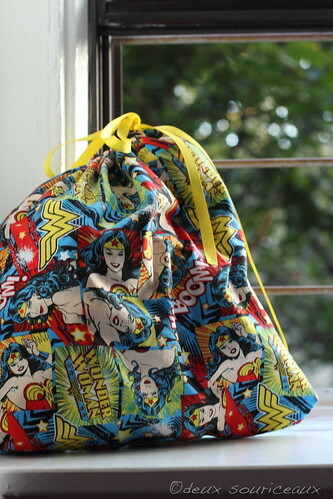 To make matters even easier, I already had two identical leftover rectangles of fabric from the Wonder Woman dress. A bit bigger than required but it’s a drawstring bag. No need to get that precise. Add yellow ribbon, and one bag for school done! I love it. Even if it is just a drawstring bag. Then, the day before E started school, we needed to get her a new backpack (I got the supply list a bit late). She has a brand new one that we got her but her teacher requested the drawstring kind because of space issues. We couldn’t find one. So I found this tutorial and got to work. There are some easier tutorials out there but this one is fully lined and uses fabric for the straps (no time to shop for cording). E picked a batik that had been hanging around my stash for a while and we agreed on the contrast. One evening and I was done! With little tabs for the straps instead of just sewing them into the bottom of the bag. That way, we can adjust it more easily if needed. I have to say though, if I ever make another one, I’ll change the sewing order a little. 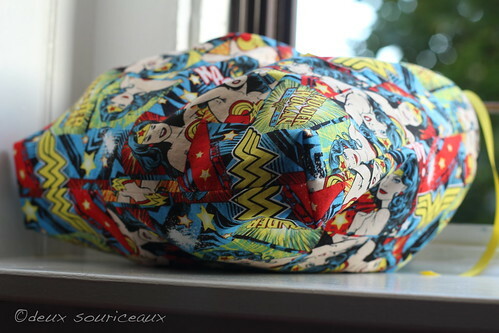 The tutorial has you sew each panel to its lining at the top before putting the bag together. Then, you have an opening in the lining to hand stitch. And then, you add a row of topstitching at the top of the bag. I’m thinking it would be more efficient to assemble the outside and the lining separately. Then, sew them together at the top. That way, the topstitching takes care of the hole. No hand stitching required. And voilà! Two super easy projects well done in record time all because I followed patterns. Sure, I wouldn’t normally need those patterns but being in a time crunch, instructions were the way to go. See? You can teach an old dog new tricks! These turned out great! Sometimes a few minutes of research really helps. =) I like that you made the backpack straps adjustable.